Disclaimer: These are not detailed instructions. If you are new at using linux, you will almost certainly have to look up a few things outside this blog to be able to follow these instructions. External display without restarting X ! A dynamic external display in nVidia Optimus Mode without having to restart the X-Server! - As far as I know this should also work on some T420/520 models to get the display port output and/or tri-head display. 1. Use bbswitch to turn the nVidia card on and off when you need it. 2. All of the rendering is done on the intel card. This requires an extra virtual screen inside the intel card which can be dynamically activated and configured via xrandr. 3. The content of the intel card's virtual screen is copied to the nvidia card via Liskni_si's screenclone for displaying on the external display. 2. Patch your intel driver to give it an extra virtual display. Now you probably have to restart X, but after you do, if you run xrandr, you should see an entry called "VIRTUAL", that's what we need. To attach an external monitor, first start the x server on the nvidia device with the xorg.conf (xorg.conf.nvidia) included with the hybrid-screenclone source (the nvidia card must be on of course - you can check this with bbswitch). If you don't see the right screen on your external monitor, try running screenclone with the argument -x n where n is 0, 1, or 2. Make some scripts out of this (you can see the scripts I have made for my use here), and enjoy your new-found freedom! I did all the things in the manual. Hunk #1 succeeded at 113 (offset 1 line). Hunk #2 succeeded at 1354 (offset 6 lines). Hunk #3 succeeded at 1419 (offset -2 lines). Hunk #4 succeeded at 1487 (offset -3 lines). Hunk #5 succeeded at 1623 (offset -3 lines). I guess that was alright. Then dpkg-buildpackage -b which created package I installed. Then I rebooted the system and run xrandr. There is no "Virtual" in it. I have T520 thinkpad with nvidia optimus. Do you know where can be the problem? Sorry for my bad English and thanks for any help. I have the same problem. After instaling the correct package, I cant see VIRTUAL in xrandr output. I have Thinkpad T420 with optimus technology. But I have optirun fully functional, bbswitch is functional too. When I use just discrete graphic it loads the nvidia module with no problem. Sorry for my bad English, thanks for any help. Your nvidia graphics driver is not properly loaded in a state where it can be used to start the X server. It appears that you have bumblebee installed. I personally do not have bumblebee installed - as far as I know it will not help you to use an external monitor via display port. I have not used external monitors with bumblebee installed. Personally, I think it is best not to have bumblebee installed unless you need to use the nvidia graphics card to display on the Thinkpad Display often. Uninstalling bumblebee seems to mess some stuff up with your nvidia driver. Last time I came back from bumblebee the only way that I could get the nvidia drivers working is by installing them straight from the nvidia website (also make sure nouveau is blacklisted in /etc/modprobe.d). Note: I have also been able to use the nouveau driver by changing xorg.conf.nvidia, so you might try that if you can't get nvidia working. But when I have bumblebee installed and bbswitch working the nvidia module is not working :-D I even tried a clean install. How did you get bbswitch working without bumblebee? This should ONLY install bbswitch, not bumblebee; you only want the bbswitch-dkms package to be installed, not all of bumblebee. bbswitch-dkms should NOT depend on bumblebee.I like to use aptitude to see info about packages. Yes modprobe bbswitch made it. Could you please give here working dropbox link on your scripts? The actual one sends me to my own dropbox. And could you share xorg.conf.nvidia? It will be really helpful. Also how do you manage intel card? I have weird feeling that It can't handle unity 3d. As far as the intel card goes. It definitely has the power to run unity 3D, but there can be a problem when both the intel and nvidia drivers are installed on the system. The problem is that the nvidia driver is not open source and runs a different implementation of 3D acceleration. I don't know much about this but keywords to search for more info would be "mesa", "GLX", "OpenGL nvidia and intel", etc. Personally, I use KDE, which does not require 3D acceleration for most of its useful features. I stick with the nvidia driver because it offers very good 3D acceleration in the rare cases where I do need it (I usually just start a separate X server or reboot into discreet bios mode when I do 3D stuff). Good luck! And there's no need to apologise about your English! It's fine. Well after lot of work, it works but not in a way I like. So I am going back to your previous solutions, and I did a startup script that replaces Xorg.conf based on whether is notebook on charger or not (I have dock station where are plugged external monitors). And after that turns on or off nvidia card. But anyway thank you. And btw the unity 3D is problem with intel driver in 12.04 not because of this solution. I can clone the image, but I can't get an extended screen to work - the xrandr command seems to not completely work - I get some flicker on my LVDS1 output, compressing the image, then reverting back. When I run screenclond -d :8, I get a cloned image of my LVDS1 but not at the resolution I selected using xrandr, and also like I mentioned, not an extended screen like twinview. Do I need to setup xinerama for that? This is a W520, nVidia Quadro 1000M, Ubuntu 12.04 (Unity), with bumblebee installed. Everything else works fine. without any arguments? Also, can you move your cursor off of one of the sides of your LVDS1, or are you constrained on all sides? The command 'screenclone -d :8 -x 1' works for me; thanks for the tip! I applied the patch correctly, I was pretty sure. This is awesome. Are there any other constrains, e.g. are there outputs which don't work with this solution? What about DisplayPort? Yes, using W520. Eagerly awaiting the day when all of this autodetects, and 'just works'. About that patch: Tomas wrote in the comment section of the patch that his setup is _triple head with hotplug_ (!!)... I wonder how that works - I only get one VIRTUAL CRTC going, I wonder if there's a parameter you can pass or something like that. He has a T420 or T520. On those models the intel card is connected directly to the VGA output. So on those models, the VGA output does "just work" without any messing around. Hence, to have triple-head, he just needs one virtual crtc to output to his DisplayPort. Really, the T series is a better machine for day-to-day linux use because of this. Hi I found your post it is encouraging but I am having trouble with step 2. Hunk #1 FAILED at 112. Hunk #2 FAILED at 1348. Hunk #3 FAILED at 1421. Hunk #4 FAILED at 1490. Hunk #5 FAILED at 1626.
hmm, it seems like your intel driver package might be too old. In my version (2.17.0), intel_display.c is in xserver-xorg-intel-2.17.0/src. I'm a noob and I don't really know what the best thing to do is, but my guess is that you need to try to find a version of the intel drivers that are closer to 2.18.0, for which the patch was designed. See if your package manager has a newer version, perhaps it is locked at 2.9.1 for some reason. Hi again, sorry it this is a bad question to ask. I have now solved the problems with step 2 and have run "dpkg-buildpackage -b" with out errors. I now have a new build dir in my xserver-xorg-video-intel-2.17.0 dir. But I do not see the package to install. Should this produce a .deb? Where should I look/what should the file be called that I can install. Also as long as I am at it what did you do to install your recompiled driver? OK, I figured it out. The .deb file from step 2 was in the parent directory from where I downloaded the source. It created two packages, I installed the non- debug one. The in step three, I used Google to to search for the missing .h files to see what libraries I needed to install. Now I have a successfully compiled screenclone application. Also a note from my troubles, I originally tried to do this on Ubuntu 10.04, to get the xserver-xorg-video-intel-2.17.0 to work, I upgraded to Ubuntu 12.04. Thanks all for your helpful comments on this blog. Cool, glad you got it working! OK, weird problem... even though the version numbers are the same, apt-get upgrade insists on replacing my custom package with the official one from the repos. I looked at pinning, but that assumes different version numbers. How can I change the version numbers so that this doesn't happen all the time? Then continue as normal and install the package. which should show all available package versions. (EE) Unable to locate/open config file: "xorg.conf.nvidia"
X: ../../intel/intel_bufmgr_gem.c:2783: drm_intel_bufmgr_gem_init: Assertion `0' failed. I did run the commands from the hybrid-screenclone folder (when i typed it in manually, it autocompleted the xorg.conf.nvidia so it's definitely there. However I noticed that I do not have a /usr/lib/nvidia/current folder. Is this normal? I don't have anything show up on a clean install under additional drivers. Did you have to install it manually? Sorry, I didn't look at the link that I sent you above very closely, and it was probably not very helpful for what we're doing. Be patient. Once you understand how everything is working together, it will be worth it. If you were able to install the nvidia driver in Discrete mode like you mention below, that's great. They should be installed even when you are back in Optimus, but they won't be running. Either way, once you have the driver installed, it is a dynamic kernel module, meaning that it can be inserted or deleted from the kernel while the system is running. Once the module is inserted, make sure the card is turned on with bbswitch. Then you should be able to start the X server on the nvidia card. hmm. this is really confusing to me... it should work. It must be frustrating for you. Note that if you restart the card with bbswitch, you have to reinsert the nvidia module with modprobe. But, if you detect nvidia with lsmod immediately before you try to start the x server, then I am not sure what's going on. Do you have nouveau installed and running (lsmod | grep nouveau)? If nouveau is loaded, it can prevent the nvidia module from loading (the vesa:Ignoring device with a bound kernel driver makes me think of this). The nvidia installer should take care of that though if you selected the right settings during the install. I think I remember running into something like this at one point, but I don't remember exactly what fixed it. Installing the nvidia driver from their website usually takes care of these things. Hmm trying it again with bumblebee and i can get screenclone to run without errors after leaving a window of (optirun) glxspheres running, but I don't get anything on the external monitor. 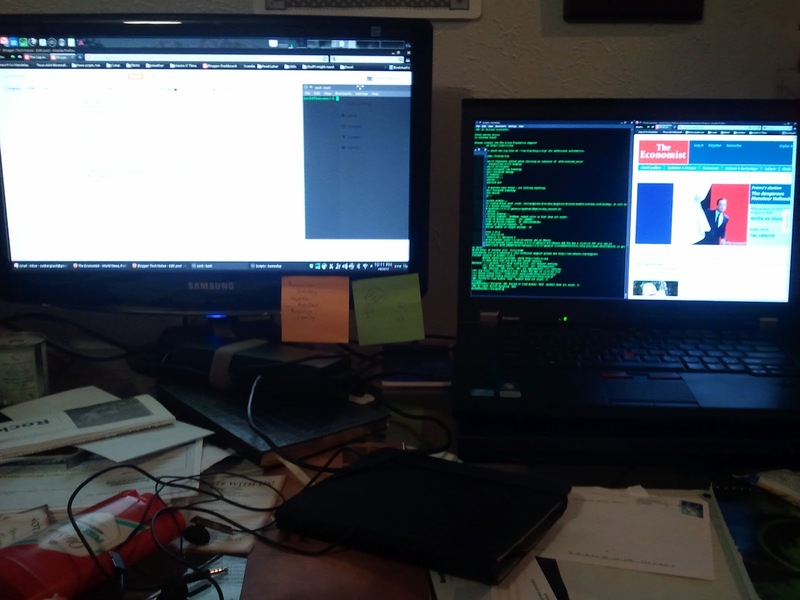 I have had no issues with disper and disper-indicator to manage external monitors without restarting X.
maybe everyone here is doing something more technical than I am, but I run external monitors with 16 workspaces & compiz cube all day long. Are you using Bumblebee and running in Optimus Mode? I cannot even get the exact fix here working on mine. It seems that I am unable in to install the Nvidia drivers when I'm on Optimus. The only way I've been able to install the nvidia drivers through "Additional Drivers" is on Discrete Mode with VT-x disabled (because of the BIOS bug). Got this working without bumblebee, but has anyone gotten 3d accel to work on the intel card without bumblebee? I can't use any of compiz's features (particularly keyboard shortcuts and workspaces, don't really care for the other stuff) since setting up this method. The problem is that some of the nvidia driver's hardware acceleration software conflicts with intel's. Bumblebee somehow allows them to be used in parallel, so if you do this with bumblebee, you should be able to get it to work. You might also be able to get it to work by using nouveau instead of nvidia to drive your nvidia card because I believe the nouveau driver is designed to work on the same DRI framework as intel's. Do you have any advice about this? Everything works now! Thanks again! thx for your post. I really need the activiation of the second display port mainly for customer presentation, so I followed the steps described above. The differences I see from your description above is the version of the Intel drivers downloaded and build. Yours is 2.17.0, mine is 2.15.0. But I am on a 32bit system (with PAE). The packae you're installing for the Intel driver is xserver-xorg-video-intel_2.17.0-1ubuntu4_amd64.deb (means you are on 64bit), mines is xserver-xorg-video-intel_2.15.901-1ubuntu2.2_i386.deb. Any hints, what I could have done wrong? Hi Zachary, thx for your quick response! I really appreciate it! I understand that the version 2.15 I have, may be be to far/different from the 2.17 you have for the patch to be applied. But I cannot figure out why you get Version 2.17 and I only 2.15 as we are both using a w520. I already remove the Intel driver using synaptic, actualized the database and reinstalled it, but this is always the version 2.15 that is reinstalled. Are you perhaps using a another repository? Perhaps an unstable one? Or do you know where I can find the driver to install it manually? I already read your other (very good) post about this, and I will give it a try if I am not successful with updating the Intel driver. Any way, thank you for your help! You can either upgrade to precise, or you might be able to get the new packages by enabling backports. https://help.ubuntu.com/community/UbuntuBackports (I think that is what I was doing when I was still running oneiric, but I'm not 100% sure). I tried this today on ubuntu 12.04 with intel-driver v2.17 on my T420. I had to change the "ConnectedMonitor" in xrog.conf.nvidia to "DFP-1". This however will cause the secondary xserver to fail to load. Also note that I had to change /usr/lib/nvidia/current to /usr/lib/nvidia-current. The only thing I'm missing now is to define the VIRTUAL-monitor as primary. I lose the VIRTUAL monitor. Thanks for the info on the 3D stuff! I noted it at the end of the blog post. OK, it does not work in gnome 3 (with or without effects). It works on XFCE but it kind of ignores the primary anyways. It works perfectly in KDE. It has some nice fun ascii art drawings to illustrate what's going on. everything up to that point went flawless. very helpful. I too could not build. I only got a warning after this. but everything what I have on Thinkpad display are transfering on external one, how to avoid it? and how to run this screenclone on startup? Hmm... unfortunately I don't have bumblebee installed (because I normally roll with three screens), so I can't test this. You might try messing around with the xrandr command and using the --primary argument (I think you might want --output LVDS1 --primary), also, you might need to change the number after -x when you call screenclone. As for using it at startup, I think that most desktop environments (gnome, ubuntu unity, KDE, xfce, etc.) have a folder where you can put scripts to run at startup. You might be able to accomplish this by putting the commands in a script and putting the script in this folder so that it runs when the desktop environment starts. Specific instructions will depend on which DE you are using. Also, you might want to use Sagar Karandikar's tool found here: http://sagark.org/thinkdisp-about-installation/ . That might have a feature to automatically run at startup, or it might just make it easier to add the display manually after you have started it up. I have never personally tried it. Those may also be of help on either problem. Sorry I can't offer more specific help. first - thanks for a great blog and post. I've been trying to setup the following 'stage': One external monitor (which I would like to use for 3D stuff, running a V.M. on top of KVM-Qemu 'connected' to the NVidia graphic card) and the laptop's lcd ('connected' to the integrated Intel chip). I got the following, so far: the VM (Linux also) uses the NVidia graphic card (I checked by running lsmod |grep nvidia on the guest) and the host -in virtualization parlance - uses the integrated Intel, checked by a lsmod | grep i915. So, in contrast to the tutorial you posted above, I did not (and am not planning to) fiddle around [too much ;D] with the intel-xorg driver and neither with screenclone/full bumblebee, if possible ..
Any ideas to let me just plug-in the external monitor and (either with or without restarting X) by using the triple - which in my case is dual- head monitor Xorg file, which you linked above, be able to have my regular desktop (running on the Intel chip) on my laptop screen and the other Linux (in the V.M.) displayed on the external monitor and using the NVidia driver ? xrandr shows: VGA-0 not connected. I too use a W520 Leno laptop. In order to use the other xorg.conf file, get completely out of X to a tty terminal and run the startx -- -config script. You won't be able to use xrandr to add a display in optimus mode without doing the whole bumblebee/screenclone thing. Also, if the virtual machine needs to have the whole nvidia card devoted to itself (i.e. the on-hardware linux installation can't simultaneously use it), you won't be able to run it on an external display. 1. Start out by booting and switching to Discrete graphics mode in the bios. This will use the nvidia card for both the thinkpad display and the external display, and you can make sure both that the nvidia drivers are installed correctly, and that you VM works with the nvidia card. In this mode, you have to use nvidia-settings instead of xrandr if you're using the nvidia driver. 2. Next, I would switch to the nvidia optimus bios mode, and create an xorg.conf file with only *one* external screen running off the nvidia card. For this, you could start with the xorg.conf here: https://www.dropbox.com/s/elcz258bjbfl8ik/xorg.conf.triple.txt and comment out everything but either the DisplayPort Screen or VGA Screen section and the corresponding device and monitor section. Again, make sure your VM and everything works. 3. Finally, modify an xorg.conf to use your thinkpad display on the intel device and the external display on the nvidia device. If you're only using the external display for your virtual machine, you probably *don't* even want to use Xinerama - then you won't be able to drag windows between screens, but you won't need to, and the graphics will probably work better without Xinerama. It sounds like you already saw the other post http://zachstechnotes.blogspot.com/2012/01/tri-head-display-on-linux-thinkpad-w520.html - that one is more relevent to what you're doing. I’ve successfully followed this guide for 12.04 but am now trying to adopt it for 12.10 and keep failing. I’m currently trying to use intel 2:2.20.2 for this but was wondering if anyone has had any success getting this or similar to work in 12.10 ? Thanks Zack for the post, excellent work ! I got nearly everything to work on 12.10, but you need the newer repo for the driver: xserver-xorg-video-intel-2.20.14_virtual_crtc.patch instead of the old one. Then, for me, one detail of the patch failed, but that was possible to fix by hand. Let me know if you need the details. Thanks for the guide! Got my W530 working with two monitors (and laptop display) perfectly now, and can even change setup of two monitors in nvidia-settings. Thanks for answering Patrick's question. I'll add a note in the instructions. I may have time in the next few weeks to do a major revision of these instructions, and fix up everything/ make it easier to follow. It looks like the patch no longer applies to the X driver source for 12.10. I stared at it for a while but it looks like the code was re-architected and the patch would need to be redesigned. Did you try the newer patch available here: https://github.com/liskin/patches/blob/master/hacks/xserver-xorg-video-intel-2.20.14_virtual_crtc.patch ? Zach: confirmed that that patch applies, although the version I happened to have today was xserver-xorg-video-intel-2.20.9 and there was one diff rejected: intel_display.c.rej. I applied the simple portion of the patch. The driver built but due to time constraints I didn't get a chance to get it working. I'm not sure why my results from "apt-get source xserver-xorg-video-intel" don't match exactly, but this patch was closer than the last patch and likely works (just didn't have time to figure out why the new driver didn't load at reboot, probably just something on my end). I was able to perfectly make on of my monitors work with this setup. Although I have screen resolution problems. 1. Is there a way I could change the screen resolution so that it could support the actual resolution of the monitor? 2. Also, as I said earlier I was able to recreate this with my external monitor which is 19 inches. I have another which is 30 inches which I use mainly for my work. This monitor turns on when the Nvidia card is activated but I not able to render any image. It something to do with the power, display port? Any ideas on this would be really helpful. Thank You! To change the resolution, you will have to modify the xrandr command when you start the virtual display on the intel card. The example xrandr command is for a 1080p display - if yours is not 1920 x 1080, you should change it to whatever the monitor is. So I was wondering if I could configure the Virtual device to render 1280x1024. For the second problem, I use a Dell3007WFP monitor which is WQXGA. Maximum resolution of 2560x1600. This turns the monitor on, because up until that point the monitor is not turned on. But after that there is nothing rendered on the monitor. Let me know if you have any ideas or if you need any more info. I would be glad to provide it. I shall also try and post the second problem on Sagark's blog. Thanks again! Unfortunately, regarding the second problem, I don't know exactly what's going on, and I don't have screenclone installed right now to test it. Sorry I can't be of more help. Ashrith, I think the problem is that you have to run "optirun screenclone -d :8 -x 1". I had the same issue and this solved it. Though now that I've updated linux to 3.5.0.26.32, I've lost the ability output to my secondary monitor. This stopped working for intel 2.20 driver (was working for 2.19) , I get low graphics mode on reboot. Above steps worked great on Ubuntu 12.10.Thanks Zackary! On Ubuntu raring 13.10, the intel driver, though, with 2.21.6 did advance quite a bit beyond the last virtual_crtc patch available (2.20.14). Does anybody by chance have an updated patch and/or figure out a new way to get dual-screen on raring? thanks! I use the old 2.20 driver with the patch in raring and it works well. If you want to use the new 2.21 driver I saw someone who got it working by switching from SNA to UXA. Hi, the version my xorg-server-video-intel package is 2:2.19.0-6, so I don't know how I could apply the patch. I tried it by hand, but I can not find all lines which should be changed. Or maybe does my package version do includes this feature already? It seems that the two versions of the patch available at https://github.com/liskin/patches/tree/master/hacks are for versions 2.18 and 2.20, so that seems to be why it won't work on 2.19. It is very unlikely that your version includes this feature already. Your other option is to take the xinerama approach that I posted about here: http://zachstechnotes.blogspot.com/2012/01/tri-head-display-on-linux-thinkpad-w520.html . That solution has it's own set of problems (for example it may not work with unity), but it doesn't require you to patch anything. after several years of running a setup which is based on this post and Sagar's, I wonder if some progress was made and newer Linuxen don't require patching drivers and installing Bumblebee anymore. Do you still use this? Did you make good experience with newer distributions? From what I read in the recent optimus guides, one needs to log out and in again quite often which obviously is not acceptable. Hi! Yes, I would say the new distributions are better, but not perfect. I usually leave my laptop at my desk these days, so I use the discrete graphics bios mode because I don't need the battery life. I believe in optimus mode you still have to restart X to turn the nvidia card on an off, so that is a pain, but now it is officially supported, so it's MUCH less buggy (but not bug-free). I haven't tried tri-head display since installing 14.04, but I think it may work in optimus mode. Thanks for getting back, even though it didn't sound very encouraging. I also have Lenovo T420 and I would like to know if it is possible to use external monitor only - as a primary - connected through the DisplayPort (DP->DVI cable) running on internal Intel HD Graphics 3000? Right now I'm on Windows 10 where it seems impossible. After connecting the monitor to DisplayPort it always starts nVidia card and it looks like a hardware issue. I would be glad if you could clarify if this works in Linux so it is maybe not a hardware issue at all. Hi, Can I tried it on my Lenovo ThinkPad E565??? Does this work for the Lenovo ThinkPad T480? I have the same device and i need to connect external displays.